I have been to the Paradise/Tahquamenon area a lot of times in recent years but I can’t remember the last time I went to Whitefish Point. 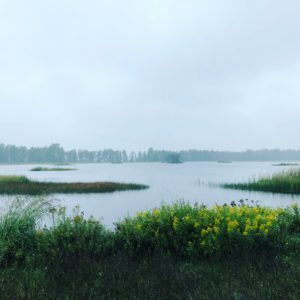 Today was the day, never mind that it rained cats and dogs just about the entire day and we were sloshing through big lakes in the Whitefish Point parking lot. Aside from short hooded raincoats we weren’t really dressed adequately for rain so we didn’t venture very far along the beach. I had read on Facebook that the road to Vermillion had recently been graded so as to better accommodate visitors so we had a tentative plan to head over there too. Although the Frog Hopper would probably have been fine on that road, it was raining so hard we bagged that part of the trip, instead taking a shorter trip to the Shelldrake Dam public access, which is in the pic. Photo ops were not good today because every time I opened the car window a whole bunch of water came in but this one ended up being publishable and I actually like it a lot. Shelldrake is a ghost town by the way and was once a thriving metropolis by yooperland standards. Today I believe most folks living in the area (at least those near the dam) are off the grid and I do not mean just the internet although we certainly didn’t have service. Lunch? An odyssey albeit a pleasant one. Did *not* want to go over to the brewery at Tahq, not because we don’t like it, just didn’t want to drive over there. Silver Creek Saloon was closed. Lumberjack Tavern (Strongs) was closed. Plan C was to drive up Salt Point Road back to the Curley Lewis and over to the res where I knew Pickles would be open. Salt Point Road was beautiful and Pickles was indeed open. Soup and deep fried mac ‘n’ cheese bites hit the spot and you are right, I am not a fan of orange cheese mac ‘n’ cheese but these things were *good*! Finally the sun is making a minor appearance and the GG and C*Q*L are taking a bit of a motor bote ride. This entry was posted on Tuesday, September 4th, 2018 at 5:31 pm	and is filed under Uncategorized. You can follow any responses to this entry through the RSS 2.0 feed. Both comments and pings are currently closed. I like those mac and cheese bites too, although I’m pretty sure they’re not healthy. We sure need the rain here; send us some, please!